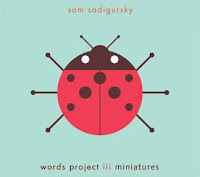 Words Project III: Miniatures - Sam Sadigursky (New Amsterdam) - In his ongoing project to connect poetry with original music, saxophonist Sadigursky has, in the past, created elaborate works, with melodies that often used a small coterie of instruments in counterpoint with the vocals. The 3rd entry in the series concentrates more on the sound and shape of the words, this time allowing the poetry to dictate the form of the songs. Few of the 18 tracks have more than 3 or 4 instruments playing; there's no real rhythm section and solos are rare. This time out, Sadigursky's focus is on the voice - even the one track that has no words is a chorale written for voices. Working alongside multi-instrumentalist Michael Leonhart (and a number of musicians and vocalists), Sadigursky is not interested in displaying his (or his sideman's) technical facility but in making the listener move easily into this aural landscape. Sometimes it's tough, the words whiz by, the images don't make immediate sense - go back, play the cut again and again and, as you do, the words and music start to come into focus. If you've not read Carl Sandburg in decades, you may have forgotten how he could create such vivid images in short sentences. There are 4 examples on this disk and each one has a unique soundscape. "Wistful"utilizes Leonhart's multi-tracked brass chorale to frame the lines while "Swirl" moves on the Middle-Eastern percussion of Richie Barshay and droning background vocals. "To Know Silence Perfectly" utilizes several keyboards, sounding not unlike Brian Wilson in his "Smile" days or the simple yet haunting songs of Robert Wyatt. Numerous horns and strings play in unison with Leonhart on "Stars, Songs, Faces" and there's a dreamy quality to this beautiful idea of how to live your life that the poet asks his reader to consider. The shortness of the cut (1:07) only strengthens the message of impermanence. Other poets include William Carlos Williams (his "Dance Russe" is a mad look at the creative process while "El Hombre"has the feel of Brazilian poem/melody by Caetano Veloso), Sadi Ranson-Politizotti (her "Now" is a song of love that Karlie Bruce sings with an aching tenderness over a chamber music ensemble) and Kenneth Patchen ("Do Me That Love" has the feel of a introspective John Lennon work.) "O Muzyke Tolstykh" uses text by Maxim Gorky that is a scree against modern jazz with a soundscape featuring bass clarinet, piccolo, baritone saxophone, tabla and moaning brass. "Light (Ample Make This Bed") features a handsome guitar melody (played by Andrew McKenna Lee) over which Heather Masse quietly recites a wondrous piece by Emily Dickinson. Sadigursky also wrote music for the words of contemporary poets Michael Lally, Han Dong, and Maureen N. McLane as well as older poets such as David Ignatow (1914 - 1997), Fernando Pessoa (1888-1935), León de Greiff (1895-1976), and Alena Synkova (1926 - ?, the only child-poet to survive the Terezin Concentration camp. Sam Sadigursky is a busy musician, playing and recording with the likes of Darcy James Argue's Secret Society, Folklore Urbano, Tibagui, Julie Hardy and Rob Mosher's Storytime. He's a fine, articulate, player whose sweet tone enlivens the various ensembles he plays with. Yet, the Words Project CDs offers listeners the opportunity to hear Sadigursky the composer, arranger and orchestrator. While there is an "art song" quality about the Projects (a style which often has a distant and impassive feel), the majority of the pieces on "..III" have emotional weight and many speak of longing or love or sadness. The musical backdrops may be spare at times (the use of kalimba on "Rain" is a perfect touch as the hand-held African thumb piano's sound can resemble falling water) but never out of touch with the words. In this time when one can be surrounded by "talk shows" on television and radio as well as the constant jabbering of politicians and fundamentalists, these "Miniatures" pack quite a punch.